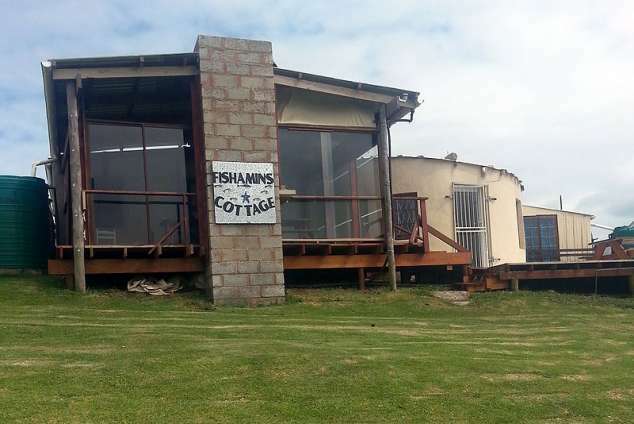 Fishamins Cottage - Mazeppa Bay, Wild Coast Accommodation. Ever dreamt of getting away from it all? Away from the City smog, traffic, hooting, shopping centres, and spending too much money? You dream of hanging your hat, grabbing your fishing rod, walking along unspoilt, idyllic beaches and just relaxing. Mazeppa Bay has it all. Safe walks, friendly people, serious fishermen, and long lazy days. Watch the dolphins as you sip your sundowners. Take in the stars as you dine on the fish you've just caught. Bring that book that you haven't had the time to read. Pack the games and play with the kids, catch up on some quality time. There are three separate bedrooms (two of the bedrooms are separate Rondawels). Bedroom one consists of one double bed, shower and toilet. Bedroom 2 consists of one double bed, two single beds, with shower, toilet and basin. The main house is the centre or the heart of the accommodation, housing the well-stocked cooking area, which consists of a gas stove, one large double fridge, two deep-freezers, microwave, toaster, kettle, and is well stocked with kitchen utensils, crockery and cutlery. There is a comfortable lounge area as well as a dining area where board games can be played as well as an occasional game of pool on the snooker table. FOR YOUR COMFORT THERE IS AN ENCLOSED, SPACIOUS BRAAI AREA OFF THE KITCHEN, AS WELL AS A SUN-DECK WITH EATING AREAS WHICH BOASTS THE MOST STUNNING VIEWS. There is a satellite dish for those who would like to bring their T.V. and Dstv machine. The main bedroom has a king sized bed. There are also 3 extra beds in an enclave which is attached to the lounge. There is also a separate shower, toilet and basin. All bedding and linen is provided EXCEPTING FOR BATH AND BEACH TOWELS. All cottages have been modestly and comfortably furnished. Please note that all water is fresh rainwater, provided by tanks and should be used sparingly. We provide a helper on a daily basis. The rate to be discussed at the time of booking. The Mazeppa Bay hotel is within easy walking distance, should you require a cold beer or a change of scenery. The Cob Inn is also within walking distance. You will have to surprise the family by catching a little "ferry" to get to Cob Inn. There is the famous Mazeppa Bay Island with a suspension bridge which never fails to appeal to visitors to the area. Abundant fish for the fishermen, long lazy walks, bird watching in the Manube Forest are some of the many pursuits to enjoy. 10847 page views since 28 Mar, 2013. Last updated on 07 Mar, 2019.